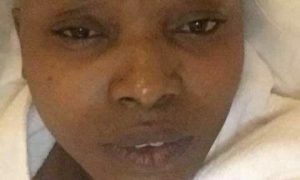 Barely hours after a Nigerian Facebook user, wished death upon Kogi state born Nollywood actress Halima Abubakar, her brother, Isah Abubakar, has issued a statement.. In the statement issued by the actress’ brother, while thanking the First Lady of Kogi State, Mrs Rashidat Bello, his sister’s fellow actress Tonto Dikeh and fans and well wishers of the actress, he disclosed that his sister is suffering from complications which came up as a result of the fibroid surgery she had in India few months ago. On behalf of our big sister,we want to thank everyone who called,commented and prayed for her. we all are grateful.And to Aunty Tonto for being a good friend and for always being there..
And to her mentor and guidance The First Lady of Kogi state @rashidayahayabello for being an example of love,and kindness towards our sister who had complications from fibroid.We love and pray for God to keep uplifting you for all you do for every one.For being a mother to our sister.